The Heidolph Laborota 4001 Rotavap provides users with easy operations and modular convenience. This rotavapor is an ideal choice for companies working with THC distillation and refinement, with a with a cold trap configuration for the trapping of low boiling point solvents. The Laborota 4001 efficient rotavapor has a compact footprint but within that foot print is an automated lift with built in stop, a sparkless brushless motor that operates quietly, with a rotation speed of 0-270 RPM a water bath and a vacuum control. This Heidolph Laborota 4001 Rotavap is designed for distillation volumes of between 50mL to 3L, and features quick release, PFT glassware for easy clean up and safety. This rotary evaporator is partnered with a sliding heating bath that moves in and out of position as needed, with its own independent control. This heating bath can be used with either oil or water, and has a nonstick interior and encapsulated heating elements to prevent scalding. This rotary evaporator also features integrated vacuum control and a vacuum pump. Please note that the pump is regulated for 80 mbar, and covers a wide range of solvents but not all solvents. Be sure to check the solvents you’re working with for compatibility, we also have other dry vacuum pumps should you need something more robust. Please note: this is a complete system tested by our service department. 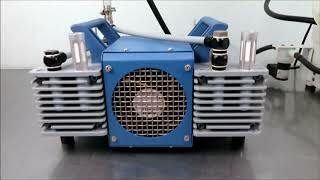 The Vacuum pump is regulated for 80mbar which is suitable for a wide range of solvents, but not all common solvents. Please be sure to check which solvents you're working with and what their evaporation rate is per vacuum. We have other dry vacuum pumps in stock should you need something more robust. This Heidolph Laborota 4001 Rotavap has been fully inspected and is performing to expectations. All of our lab equipment comes backed with our standard warranty. Should you have any questions, please don't hesitate to contact us.